The group of smoke-shrouded figures exuded an air of enthusiasm as one of their number methodically produced yet more gouts of vapor from the barrel of the stainless revolver. Each throaty "Boom" rendered also an emphatic "Clang" - hammer and tongs, shot and bullet strike, reverberating off of the hills surrounding this hollow on the edge of the Ozark National Forest. The event was the spring 2005 convocation of the Confederate Sixgunners of America and the exact venue was just a few miles north of Clarksville, Arkansas. 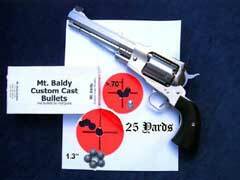 The revolver was a Ruger Old Army strongly upgraded by David Clements of Clements Custom Guns. I approached the scene as the revolver made its round among the uncommonly skilled shooters - all of them CSA but a number of them Yankees as well. 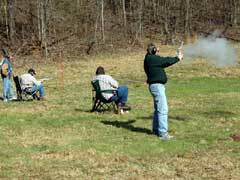 Each shooter took his turn, methodically and unerringly chiming the 6x8" steel hanging danglers 25 yards down range. The revolver diverged from the familiar Ruger pattern by way of a pair of micarta grips and an octagonalized barrel topped by a nicely sculptured extra-tall front sight dovetailed into a ramp. When my turn came around, I assayed my usual, classic, "NRA," "duelist" stance, adjusted my pince-nez reading glasses and proceeded to accomplish the first clean miss of the afternoon. I hasten to report, though, that four of my five shots struck the steel gonglettes soundly and sent them dancing like barefoot liberals newly arrived in Hades. Not altogether a bad showing. The real epiphany came when one Jimmy Pilcher walked up to the line, glanced at the 25 yard swingers and then hammered the 8x10" fifty- yard gongs one after another, dead center, five for five and calmly laid the Clements on the shooting bench. He insists that the performance was a fluke but I have not often seen five such perfect flukes in a row. The modified Ruger advanced from the merely "interesting" to outright "intriguing." Octagonal Barrel from a Krieger blank - bore diameter.485". 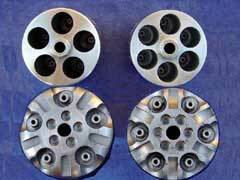 Chamber mouths to match at about .486". This dimension was chosen to allow use of the standard commercial or mould cast .490" balls used in the fifty-caliber muzzle loading rifles and handguns. 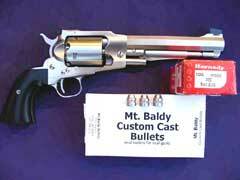 It is also well suited to the .488 caliber conical bullet from the Mount Baldy Company that we were using at CSA 2005. The cylinder on this early revolver is not line bored as is often the case with modern custom revolvers. The frame depth of the Old Army prevented use of Clement's line boring tooling. As we shall see, this factor did not negatively influence the revolver's accuracy. 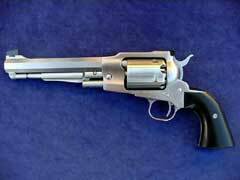 For five shot cylinder carry-up. Nicely dovetail-mounted to afford ample adjustment range for the Ruger adjustable rear sight. 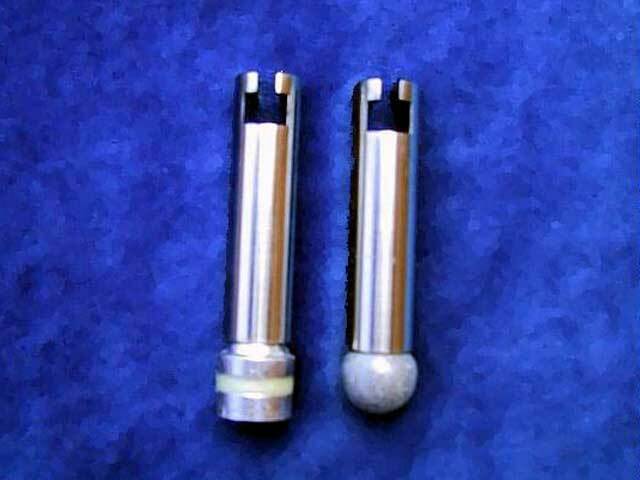 One seating stem configured for round ball and the other shaped to fit the semi wadcutter bullet. This assures concentric seating - a necessary component to percussion revolver accuracy. The .50 will work with traditional black gunpowder or any of the modern substitutes but is designed with Hodgdon's H777 in mind. 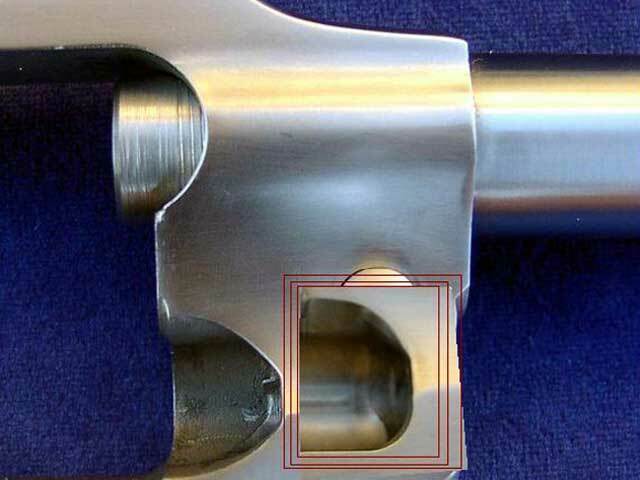 Not only does 777 generally obtain the highest velocities among the modern substitute propellants, but it also leaves the least amount of fouling to tie up this tightly constituted revolver. Even so, with the tight Barrel/Cylinder gap, Billy finds it necessary to remove and wipe the cylinder front and back every ten rounds or so. 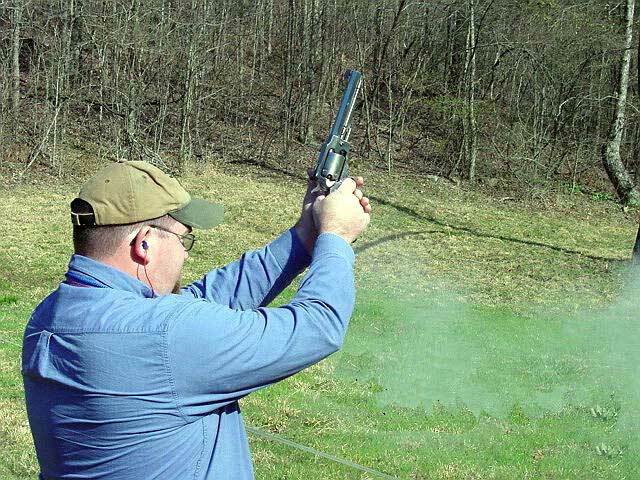 Like other black powder substitutes, H777 is a volumetric equivalent to the original. It does not weigh the same but takes up the same amount of space in a measure, as would the designated weight of black powder. 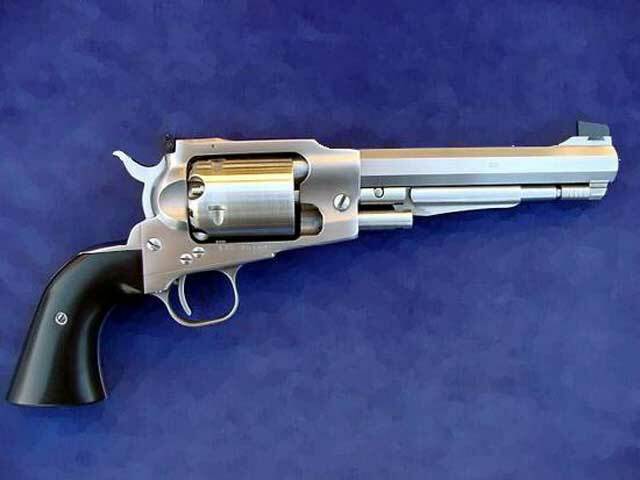 In his experimentation, Clements came to expect that a 50 grain/volume equivalent of H777 under an Ox Yoke Wonder Wad and the .490" ball would produce an average velocity of 1250 feet per second and 607 foot-pounds of energy a few feet in front of the muzzle. Over the 45-grain equivalent of the same powder, Clements found the 250 grain Mt Baldy SWC doing 1150 fps with the foot poundage at 734. Either set of figures, accompanied by reasonable shot placement is sufficient to sledge down a Texas whitetail or deal decisively with the most obstreperous of our feral hogs. The bullet energy in fact, matches and exceeds most of the 158- grain bullet loadings of the .357 Magnum cartridge with quite an excess of bullet diameter in the bargain. Clements considered deep-boring the chambers in the manner of the .45 Old Armies but found that any substantial increase in powder capacity would result in inertial pulling of the balls under recoil. The optimum charge is the 50 -grain/vol. Loading of H777. With the temperature at 79 degrees and elevation about 500 ft above sea level. Billy attributes at least some of the additional velocity to the percussion caps used for testing. He recorded lower velocity and wider extreme spreads with CCI caps. Clements also used CCI caps for his testing. Billy's results-recorded above came with Remington # 11 caps. The initial energy of the ball load has 100 ft/lbs energy over a favored .44 Special combination of 250 grain bullet at 1,000 fps. 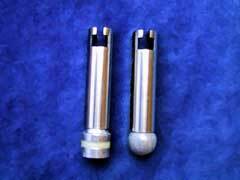 The 250- grain bullet load exceeds the original .357 Magnum loading of a 158 grain bullet at 1500+ feet per second. There is enough bullet energy here to satisfy any reasonable handgun task and then go on to do a journeyman's job on some that are not reasonable at all. Billy's extreme spreads show a very high degree of consistency - well within the expectations that we would attach to any cartridge arm of similar power and particularly salubrious with the Hodgdon's propellant. Many of us who experiment with the percussion revolvers find that H777 turns in very erratic velocity spreads along with the high velocities. This appears to be the result of excess compression of the powder column upon loading. Billy's front stuffing technique is very deft indeed. This became even more apparent when he sat down to shoot some 25-yard bench groups. They fell with metronomic consistency into 1.5" and under. The best group so far measures just a bit under 70 - caliber center to center with the 250-grain bullet load. The overall impression is that this load has a slight accuracy edge over the swaged round ball. Billy frequently wonders out loud who, beside himself would want such a revolver and if there is any real practical purpose behind his project. I kind of wondered the same thing before I saw it shot, shot it myself and saw Billy's research results. Aside from being it's own excuse for existence, it has several practical attributes that recommend it to the enthusiast. First of all it is a very fine piece of the gunsmith's art - both in concept and execution. The fit, finish and design shout Quality. On a practical note, it escapes being a "firearm" as defined by federal law and is subject far fewer restrictions in most jurisdictions than the cartridge arms. Under the Penal Code of the Sovereign State of Texas the percussion revolvers are not handguns nor even yet, firearms. There are many and sundry advantages to having a gun that is not a gun but yet will summon up more kinetic energy than most conventional handguns - and out-group them in the bargain. For more info on Clements Custom Guns, check out www.clementscustomguns.com. Clements Custom Guns' fifty-caliber five-shot percussion revolver, built on a Ruger Old Army. Billy Fugett at CSA, 2005. He wanted and got a percussion revolver that would be adequate for Texas game. 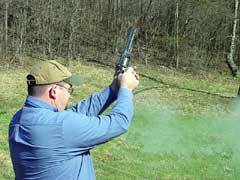 Jason Freeman shoots the Clements/ Fugett revolver. Recoil is significant but not unpleasant. Billy obtained excellent accuracy from the Custom Mt. Baldy 250 grain Semi-wadcutters and the swaged lead balls of .490 diameter. 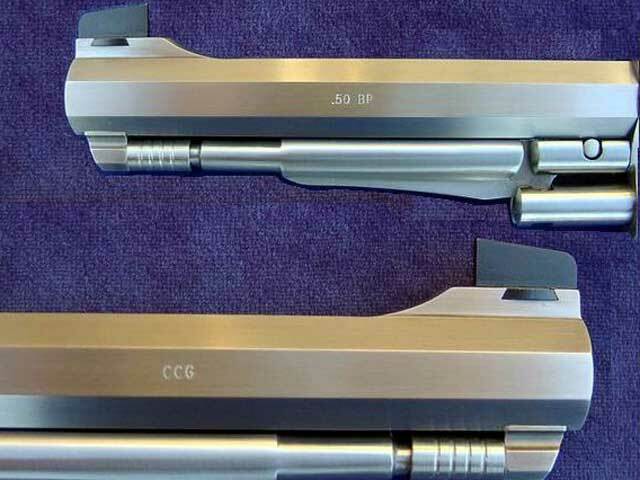 At the heart of the conversion is the custom-made five shot cylinder (left), shown in comparison to a standard six-shot Ruger Old Army cylinder (right). Properly shaped seating stems assure straight loading of the projectile into the chamber. The Clements/ Fugett revolver has separate ram heads configured for bullet and ball. Billy believes that the bullet loadings show a slight accuracy advantage over the sphere. 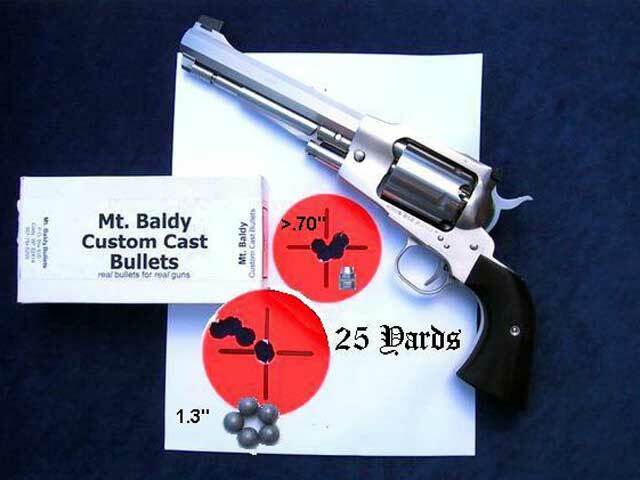 It is infrequent that bullet accuracy even approaches the level obtainable with round ball from a percussion revolver. It is an attribute observed in my stock Old Army and is even more evident in the .50 caliber five-shooter. The loading window is opened and reshaped to allow proper seating of the custom semi wadcutter.